Lyngdorf Digital 2.2 System (hi-fi) review | What Hi-Fi? You might recognise some of the components in this Lyngdorf 2.2 system: we've tested the TDAi 2200 amplifier back in the day where it garnered a strong four-star review, while the CD1 CD player romped to five stars in February 2007. The exercise here is to complement these two fine products with their natural Lyngdorf partners to create what ought to be a well-matched system. The electronics are as lavishly constructed as they ought to be at their respective prices (the amp is £4245 in isolation, the CD player £1795), but there's much more to the Lyngdorf experience than the tactile pleasures of a beautifully balanced volume control. 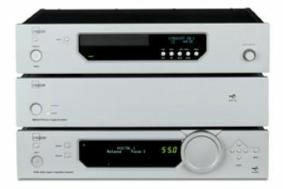 The TDAi 2200 is a fully digital design able to receive a direct digital feed from its partnering CD player and amplify it, still in the digital domain, to the tune of 2 x 375w (in this system: it's 2 x 200W into 8ohm speakers). fitted to many home cinema receivers, uses a microphone-based measurement system to automatically adjust the musical signal to your room's acoustics. It can also be fitted with an optional analogue-to-digital input board for four more components, should you wish: the complete amp in this form costs £4685. The CD1 features a Wolfson WM8740 DAC and sample-rate conversion to 192kHz, plus the ability to output audio at 24-bit resolution to a suitable DAC, such as that included in the amplifier. Used like this, the Lyngdorf allows users to shut down all its analogue stages too, turning it into a transport – in theory, a better solution for accurate data retrieval. So, that's the system's foundations: here, we're testing them alongside the Danish company's dedicated – and distinctive – 2.2 speaker system, comprising a pair of DP-1 floorstanders plus two BW-1 ‘boundary woofers' to reproduce low frequencies. The DP-1s are dramatic, sculptural and unmistakably modern, their cabinetless, dipole design contributing both to their visual appeal, and offering theoretical technical benefits – cabinets are notoriously difficult to control, which is why Lyngdorf feels the best type of speaker cabinet is one that's not there at all. The DP-1s are specifically designed to be bass-limited: instead, sounds below 300Hz are relayed to the BW-1s, each of which features a single, passive 25cm bass driver. The BW-1s must be positioned next to the wall and in front of your listening position facing towards you to give of their best. Together, the four speakers combine to create the sonic impact of a pair of much larger conventional speakers yet, in theory, deliver a more accurate and acoustically harmonious sound. Wiring and installing the Lyngdorf set-up is only a little different from the norm. The BW-1s require their own power amplification, taken care of here by a SDA2175 stereo power amp, another digital design able to deliver 2 x 375w in this context. Connecting the rest of the system is easy: you'll require a digital cable to feed sound the CD-1 into the TDAi 2200, and then it's simply a matter of linking in a microphone and setting the RoomPerfect calibration system loose on your listening room. Once each acoustic vagary has been accounted for and each tonal colouration dialled out, it's time to listen. With Nerina Pallot's Idaho, the Lyngdorf system sounds every bit as clean, detailed and insightful as we'd expected it to be: her vocal inflections are crisply resolved and utterly convincing, while imaging is wonderful. Sparse recordings, such as Seasick Steve's The Banjo Song, are similarly transparent and ‘real', the Lyngdorf's exceptionally clean, neutral sound putting you close to the heart of the recording in a manner few can emulate. You can tweak the balance to your tastes too, the TDAi 2200 offering DSP-controlled presets to modify the sound. We found the amp's ‘Focus' mode worked particularly well with this simpler style of music. Switch to a broader-scale sound such as Hans Zimmer's muscular score to The Dark Knight, and the Lyngdorf continues to impress, but with some caveats. It musters considerable scale as the score's brooding dynamics thunder into the room, coupled to plenty of weight and depth. However, that bass seems tonally distinct from the efforts of the DP-1 speakers – RoomPerfect or no – while timing is a little off, a sensation amplified by a pacy rock track such as My Chemical Romance's Desolation Row. Listening to the CD and amplifier in another listening room through a more conventional pair of speakers (ATCs) suggested that some of that could be attributed to the DP-1/BW-1 combination, but even so, the timing issue is still present. That said, the Lyngdorf system's manifold strengths are more than enough to earn it a recommendation. It's not an all-rounder, but it manages to combine superb levels of insight with sumptuous build and, as you can see, design that stands apart from the mainstream. If your living-room is an acoustic issue – and let's face it, most will be – it's well worth investigating.